The threat from antibiotic resistance is more pink than purple. 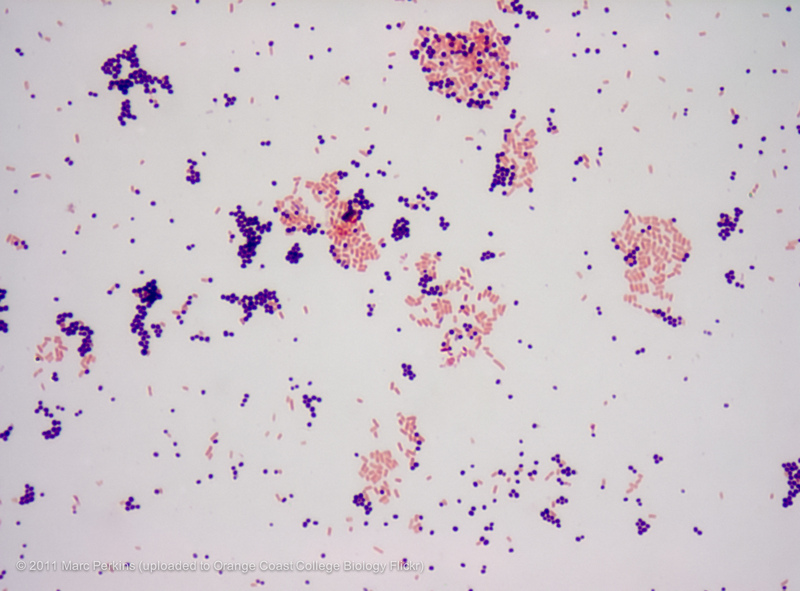 You probably need to be a microbiologist to get this: Gram-positive bacteria (such as MRSA and C. difficile) stain purple in the Gram stain, whereas Gram-negative bacteria (such as Klebsiella pneumoniae and Acinetobacter baumannii*) stain pink. All of the international concern surrounding antibiotic resistance from the WHO, CDC, PHE and others have focused our mind on one threat in particular: carbapenem-resistant Enterobacteriaceae (CRE). The Enterobacteriaceae family of bacteria are all Gram-negative, so we need to focus our drug discovery towards the Gram-negatives rather than the Gram-positives. I blogged last week on the fanfare surrounding the discovery of Teixobactin. Whilst it looks promising, it’s still a long way from the pharmacy shelves, is most certainly not “resistance-proof” and, most importantly, only active against Gram-positive bacteria. I’ve received some useful comments in response to the blog pointing me in the direction of another novel antibiotic, Brilacidin. Brilacidin is a novel antibiotic class that is in many ways more promising than Teixobactin, not least due to its activity against both Gram-positive and Gram-negative bacteria. Furthermore, it’s much closer to the pharmacy shelves, having undergone promising Phase 2b clinical trials (showing broadly comparable efficacy to daptomycin for the treatment of acute bacterial skin and skin structure infections). Brilacidin is not without its problems though. Firstly, it is not active against A. baumannii. This is important, since multidrug-resistant – especially carbapenem-resistant – A. baumannii is a serious problem in ICUs around the world. Secondly, although the antibiotic is truly novel (working on the principle of ‘defensin-mimetics’), manufacturer claims that resistance is ‘unlikely’ are as fanciful as the “resistance-proof” claims associated with Teixobactin. Every class of antibiotics was novel once. And resistance has developed to them all! There are some other emerging options for the antimicrobial therapy of multidrug-resistant Gram-negative bacteria. A number of beta-lactamase inhibitors combined with existing antibiotics are currently at various phases of the clinical trials process (for example, avibactam and MK-7655). Again though, although promising, beta-lactamase inhibitors have limitations, the most important being their specificity. For example, these inhibitors are effective against only some beta-lactamases (and have a blind spot for the metallo beta-lactamases such as NDM-1). So, there is no silver bullet coming through the pipeline. And there will be no silver bullet. However clever we are in discovering or designing new antibiotics, some bacteria will always find a way to become resistant. It would be naive to think otherwise. Drug discovery is one part of our response to the rising threat of antibiotic resistance, but we ultimately need to focus on prevention over cure. * Actually, A. baumannii is a bit “Gram-variable” so is somewhat pinky-purpley – but let’s not get too hung up on that. ← Teixobactin: a “resistance proof” antibiotic? No chance! A key Cellceutix collaborator, Fox Chase Chemical Diversity Center, has received a 1-year extension on a subcontract from the University of Massachusetts (Amherst) under a UO1 National Institute of Health grant. The subcontract of $565,440 will be used to continue research on the development of the Cellceutix platform technology of host defense protein mimics (HDP mimics or defensin-mimetics) to combat serious and life-threatening infections caused by multi-drug resistant Gram-negative bacteria. *****The target pathogens include multi-drug resistant Acinetobacter baumannii, Pseudomonas aeruginosa and the carbapenem-resistant Enterobacteriaceae (CRE)Klebsiella pneumoniae and Escherichia coli. Initial research will focus on continuing the development of lead compounds active against CRE organisms, including CTIX 1807, which has shown robust activity against Klebsiella pneumoniae in a mouse tissue infection model. I’m not surprised you only recently became aware of Brilacidin. I just spent the last three days in San Francisco at the Biotech Showcase and whenever talk of antibiotics came up I’d mention Brilacidin and I only ran into one person that is aware of it, and they hadn’t seen the results yet. I am one who requested your evaluation of Brilacidin. Thank you for this response. Perhaps one of the other drug candidates Cellceutix acquired from Polymedix will be effective against A. Baumannil. We can only hope. Thanks again! Jon, Thank you for discussing Brilicidin! I am looking forward to future coverage of advances in antibiotics. Here is a link to the full Brilacidin paper for those interested. jon, another angle to the Cellceutix defensin-mimetic platform acquired via the 2013 purchase of polymedix– beyond the gram-negative and anti-fungal goodies (against baddies, malaria even)–is the Polycide product line. polymerizing compounds and applying them to various surfaces, ie, medical devices and the such. one study showed it beat the pants off of triclosan (and tricolsan is everywhere… see Tufts study below… and coming under added FDA/EPA scrutiny…. not as safe, not as effective) as to coating sutures. so maybe another blog post is in order on medical devices and antimicrobials. Thank you so much for sharing information about this research, John. We’ve had a big upsurge in ESBL-producing E. coli UTIs in our community, not just in healthcare institutions, and it’s good to know that possible antimicrobials for this organism are in the pipeline.